Anne Akiko Meyers is bringing the world’s most expensive violin to town to play with Pacific Symphony this week. It has been loaned to her for life by the owner, who bought it in late 2012 for more than $16 million, still the highest price ever paid for a violin. The instrument, made in 1741, is known as the “Vieuxtemps” Guarneri “del Gesù,” named for one of its former owners, the Belgian violinist and composer Henri Vieuxtemps (1820-1881). He loved the instrument so much that he wanted to be buried with it. “Its health and security are always the utmost important factors when traveling,” Meyers said of the instrument recently in a phone interview. Nevertheless, she doesn’t seem particularly intimidated by the prospect. She’s had to care for expensive violins, on loan, for most of her career. She wants to pass it on to the next player in the same condition is it now, which she characterizes as near perfect, clean and crack-free and without so much as a sound post patch (common in most violins). Born in San Diego in 1970, Meyers began playing violin when she was 4 or so, by then living in the small desert town of Ridgecrest in the Mojave Desert, where her father was president of the local community college. Her mother, of Japanese descent but not a musician, actually introduced the Suzuki method to the community. Helmick was a local musician in Ridgecrest (still is) and became Meyers’s first teacher. At 7, Meyers, playing a concerto by Vivaldi, actually made her debut with the Desert Community Orchestra in Ridgecrest, with Helmick playing the continuo part. Meyers went on to study with a number of noted teachers, including the sisters Alice and Eleanor Schoenfeld at the Colburn School in Los Angeles and then, at 16, with Dorothy DeLay at the Juilliard School in New York. She had made precocious debuts with the Los Angeles Philharmonic and New York Philharmonic by age 12, and appeared on “The Tonight Show with Johnny Carson” twice when she was 11. But don’t call her a prodigy. 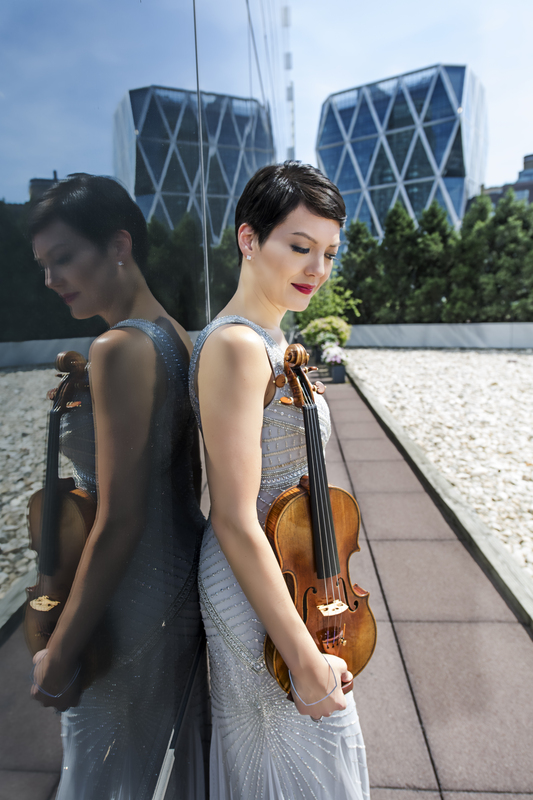 She calls her time at Juilliard and with DeLay, the teacher of many a superstar violinist, “a very rich time to figure things out. Meyers will release her 37th album in September. In addition to much of the standard repertoire and crossover (she made a record with Michael Bolton), Meyers increasingly commissions, performs and records the music of living composers. The 37th album is a tribute to the Estonian composer Arvo Pärt on his 83rd birthday, and in addition to pieces by Pärt includes music commissioned by Meyers by Philip Glass, Morten Lauridsen, John Corigliano and others. Earlier this month, with the Phoenix Symphony, she gave the premiere of a new concerto, “Orchard in Fog,” by Adam Schoenberg. Michael Daugherty is writing a new concerto for her. In the fall, Pärt has invited her to perform in events celebrating the opening of a new building at his center outside of Tallinn. She contributes a trio of short solo works to the Pacific Symphony’s program (which also includes Glinka’s Overture to “Ruslan and Ludmilla” and Strauss’s “Ein Heldenleben”) this week. “It’s a piece that is so close to my heart. I harassed Morten Lauridesen for years and years to write a new work. He was like ‘I have so many commissions up the wazoo, I just don’t have the time.’ Then I performed the Vivaldi ‘Four Seasons’ with the Pasadena Symphony and he attended that concert. After that, he was like ‘I’ll do anything you ask.’” The new arrangement is the result. The third piece she’ll play is a plum of the violin repertoire, Ravel’s “Tzigane,” which was inspired by the Hungarian gypsy style of violin playing. This entry was posted in classical music, feature and tagged Anne Akiko Meyers, Leonard Bernstein, Ravel, violin by pacificsymphony. Bookmark the permalink.